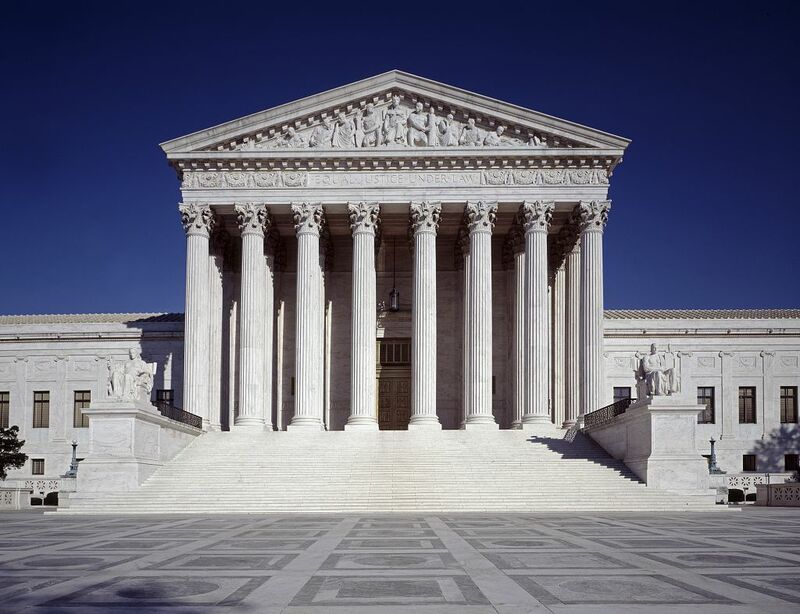 The U.S. Supreme Court gave the green light to school vouchers in the 2002 case Zelman v. Simmons-Harris, clearing the way for states to create programs that provide public funding for religious schools. But the Zelman decision addressed a specific program that served children from poor families in Cleveland. And the voucher programs that have proliferated in the past 15 years look very different and serve different purposes from the local Cleveland program. The court ruled 5-4 that the Cleveland voucher program didn’t constitute a state endorsement of religion – and thus a violation of the establishment clause of the First Amendment – because the tuition vouchers went to the students’ parents, who then directed the funding to the schools they chose. Indiana Chief Justice Brent Dickson relied on similar reasoning in Meredith v. Pence, the March 2013 state Supreme Court ruling that found Indiana’s voucher program did not violate the state constitution’s ban on state funding for religious organizations. But some of the justifications the Supreme Court cited for supporting vouchers in Zelman don’t apply to many of the two dozen or so voucher programs that now operate in 15 states, with more likely to come. Research led by an Indiana University professor confirms what school voucher critics have long argued: Voucher programs receive public funding yet discriminate on the basis of religion, disability status, sexual orientation and possibly other factors. The finding is especially timely as President Donald Trump and his designee to serve as secretary of education, Michigan school-choice activist Betsy DeVos, have indicated they will use federal clout and money to push states to expand voucher programs. The study, “Dollars to Discriminate: The (Un)intended Consequences of School Vouchers,” was published last summer in the Peabody Journal of Education. Co-authors are Julie Mead, a professor at the University of Wisconsin-Madison, and Jessica Ulm, a doctoral student at IU. The researchers examined 25 programs in 15 states and Washington, D.C., that provide public funding for private K-12 schools, including traditional tuition voucher programs and voucher-like programs called education savings accounts. 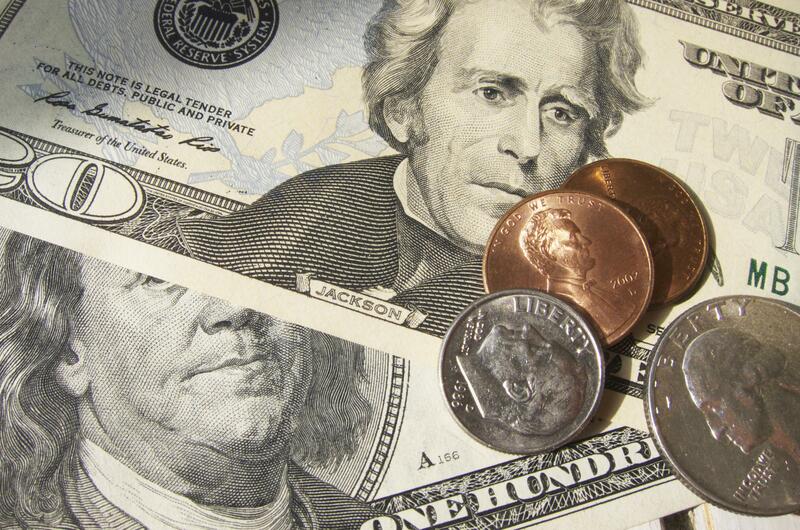 Indiana is one of seven states with a statewide voucher program. Other programs are limited to cities (Milwaukee, Cleveland) or special-needs students. The authors say legislators who authorized the programs neglected to write policies that provide equal access for students and avoid discriminating against marginalized groups. Education may not have been a central focus for Saturday’s Women’s March on Washington and the supportive marches and rallies across the country, but neither was it missing from the agenda. I know for a fact that many of the people who gathered at the Indiana Statehouse in Indianapolis were teachers, parents and other avid supporters of public education. 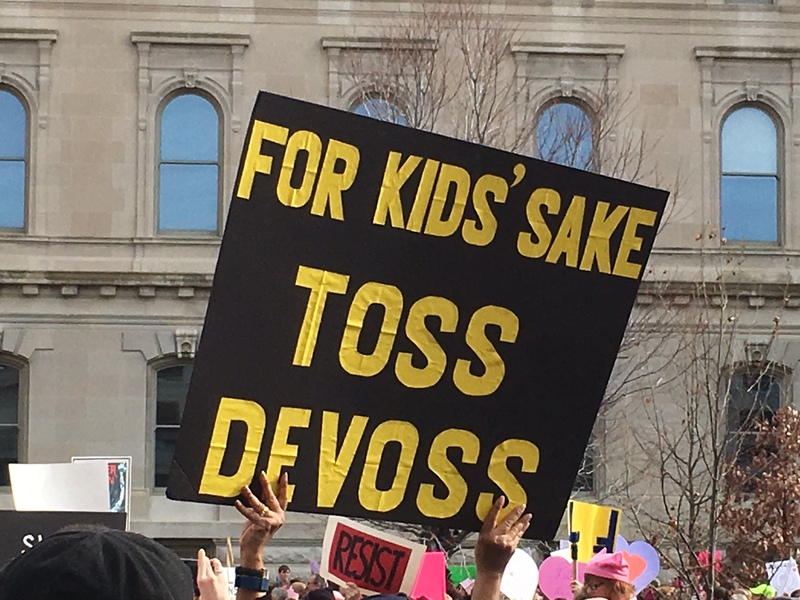 And some of the best signs at the marches mocked Betsy DeVos, President Donald Trump’s pick for secretary of education, for her comment about schools needing guns to protect children from grizzly bears. The solidarity exhibited at the marches and rallies is important, because it’s going to take more than education advocates to push back against the school privatization agenda that Trump and DeVos apparently plan to push. People who believe in justice for women, children, people of color, immigrants, LGBTQ people and others will have to work together for the next four years and beyond. Trump said during the campaign that he wants to spent $20 billion in federal funds for school vouchers, which pay tuition for students to attend private schools, including religious schools. DeVos, a Michigan billionaire and Republican activist, has long pushed for vouchers and religious schools and fought against teachers’ unions and even accountability for charter schools. Democratic senators made a good start at DeVos’ confirmation hearing before the Senate Health, Education, Labor and Pensions committee. Al Franken exposed that the nominee didn’t seem to know the difference between proficiency and growth on standardized tests. Tim Kaine and Patty Murray revealed her lack of familiarity with federal civil rights law protecting students with disabilities. Elizabeth Warren and Bernie Sanders hammered her inexperience with higher education and student loans. If he was right, it may be hard to make Indiana’s new Republican senator, Todd Young, understand the danger to public education posed by Betsy DeVos, Donald Trump’s choice to be secretary of education. DeVos and her family contributed $48,600 to Young’s campaign last year, helping him win election against Democratic former Sen. Evan Bayh. She and several relatives – her husband, father-in-law, mother-in-law, brothers-in-law and sisters-in-law – appear to have each given the maximum $5,400 in 2016. Young sits on the Senate Health, Education, Labor and Pensions Committee, which is scheduled to hear testimony on DeVos’ nomination today and will vote on whether to recommend her confirmation. The DeVos family’s direct contributions to Young’s campaign were a pittance for an election in which more than $30 million was spent by the two sides. Young will no doubt say they won’t be a factor in his vote. But the family also gave millions of dollars in 2016 to GOP and conservative political action committees, including the National Republican Committee, the Senate Leadership Fund and American Crossroads. Some of those PACs spent millions on nasty political ads trashing Bayh and painting him as a flaming liberal (a joke for Hoosiers who remember his tenure as governor and senator). This is a good time to remember that, yes, the arc of the moral universe may bend toward justice, but it can be excruciatingly long. That’s a slightly twisted version of an aphorism that’s most strongly associated with the Rev. 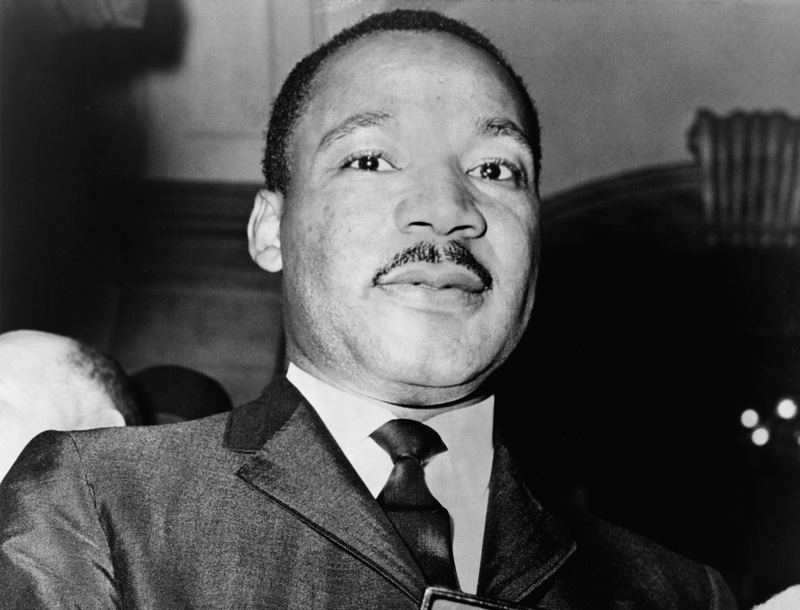 Martin Luther King Jr., whose birthday we celebrate today. Around the country, many schools are closed for the holiday. Others are in session, but hopefully teachers are teaching about King’s life and legacy. And hopefully schools everywhere are focusing their history lessons not just on King but on the civil rights struggle, and not only frontline leaders like King and Rep. John Lewis but strategists like Ella Baker and Bayard Rustin and fearless combatants like Fannie Lou Hamer and Vernon Dahmer. (Look them up!). The effort to mark King’s birthday as a national holiday began soon after he was murdered in April 1968. Even that took 15 years to succeed; the arc was long. In 1983, President Ronald Reagan signed into law a bill that made the third Monday in January a federal holiday memorializing King. Authors of the bill were Republican Jack Kemp of New York state and Democrat Katie Hall of Gary, Ind. The Indiana Department of Education released A-to-F grades for school districts this week, and 60 percent of districts were awarded B’s under the new grading system. That’s probably about right. All the evidence suggests most public school districts in Indiana are doing a pretty good job. But if we’re honest, most could probably all do a little better. 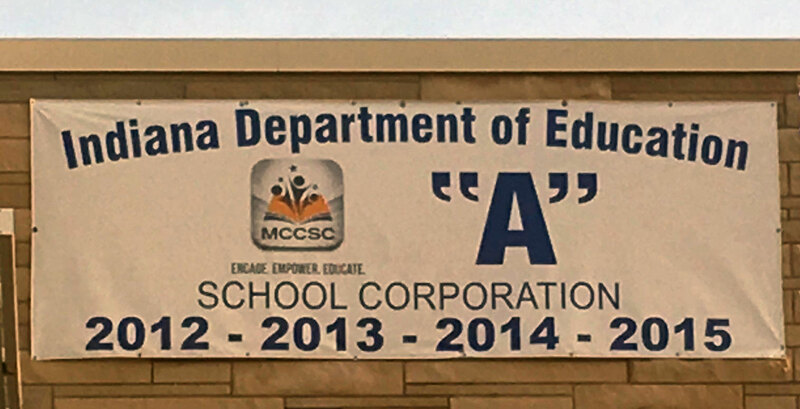 Some school districts may need to change their branding as a result of new district grades. One of the most consistent findings of the annual Gallup/Phi Delta Kappa Poll of the Public’s Attitude Toward the Public Schools is that people are more likely to give their local schools a B than any other grade. And those are the schools that the public knows best. The whole idea of labeling schools and school districts with letter grades still makes little sense, however. It’s quite likely that school districts that received A’s, for the most part, are no “better” than those that got B’s. And those that got C’s are no worse. This is how lawmaking is supposed to work. It starts with a friendly talk with a constituent at the county fair and moves on to legislation given a positive reception in a Senate committee. If things go the way they should, it will end up with a new law that provides modest but important help for public schools. Senate Bill 30 would require the Indiana Department of Education to report to school districts twice a year on the number of local students receiving tuition vouchers and the private schools they attend. Introduced by Sen. Eric Koch, R-Bedford, it’s scheduled for consideration today by the Senate Education and Career Development Committee. The idea was hatched last summer, when Koch ran into Laura Hammack, the newly appointed superintendent of the Brown County School Corp., at the school district’s popcorn booth at the Brown County Fair in Nashville. “It was like 8,000 degrees outside and we were covered in popcorn grease,” Hammack recalled. Koch asked about school issues, and Hammack said she was concerned the district was losing students and, as a result, losing state funding.